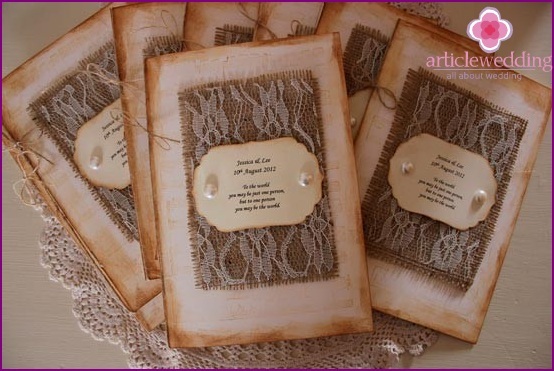 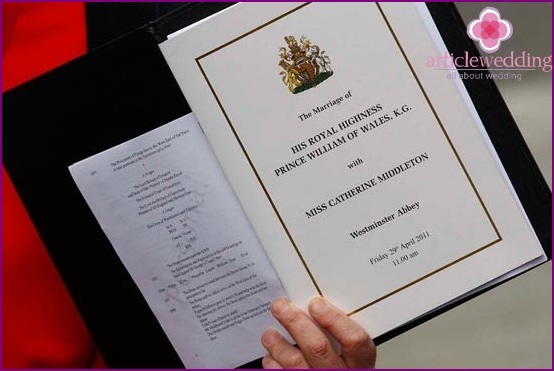 Wedding Program - one of the most useful andmultifunction celebration accessories. 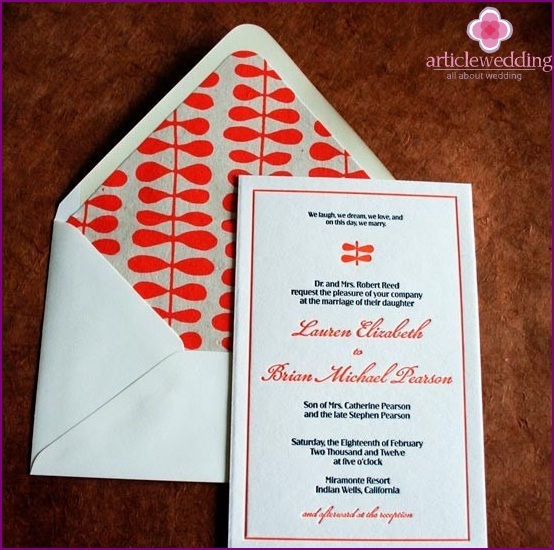 If you aspire to minimalism, the program will be described in the course of the holiday, its highlights and daily entertainment. 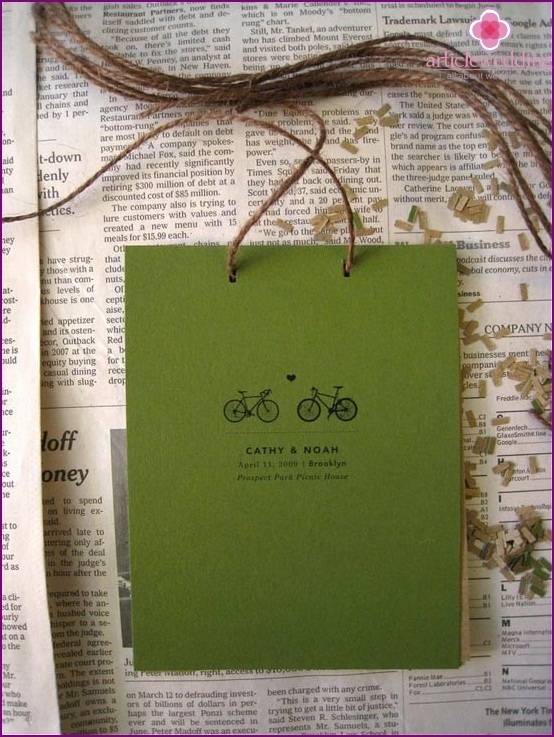 If you want to make a more detailed accessory and useful to visitors, develop it in detail. 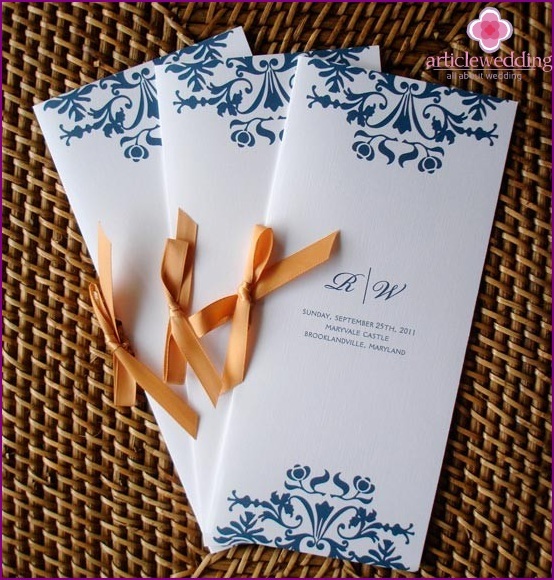 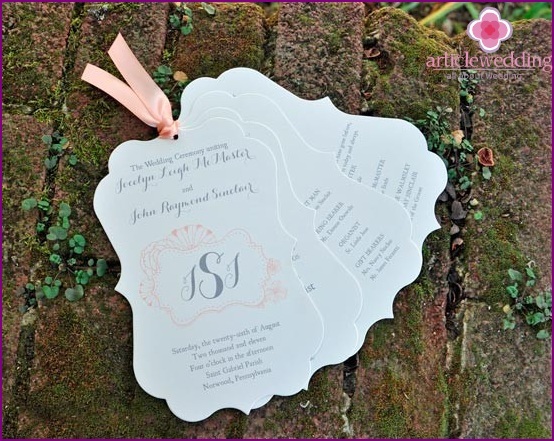 Turn to him the guest list and brief information about each, seating chart guests order congratulations card (place of registration, wedding walk, the route to the banquet hall), the procedure for competitions, etc. 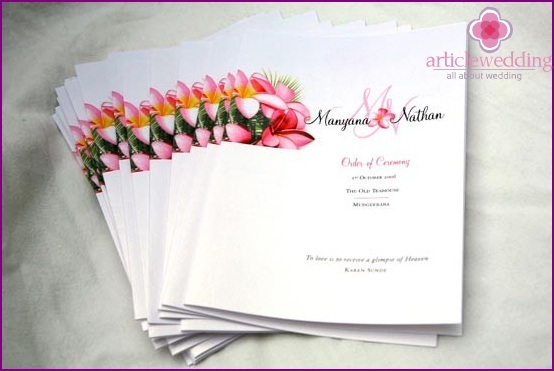 This article will help select the most successful variant design wedding program for your celebration. 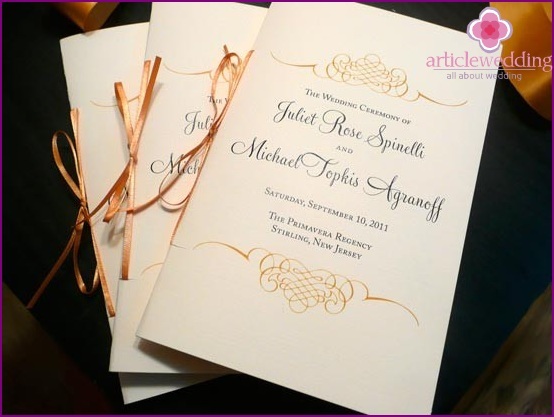 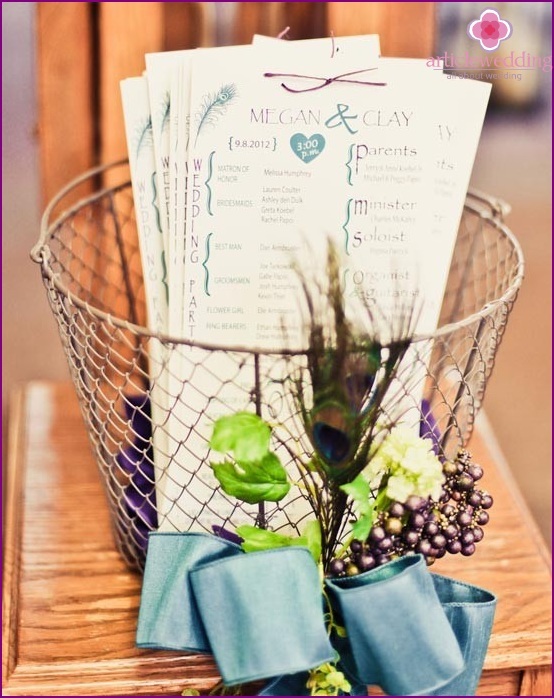 Carefully printed in color as a program,folded as a booklet, fit the classic weddings and official receptions. 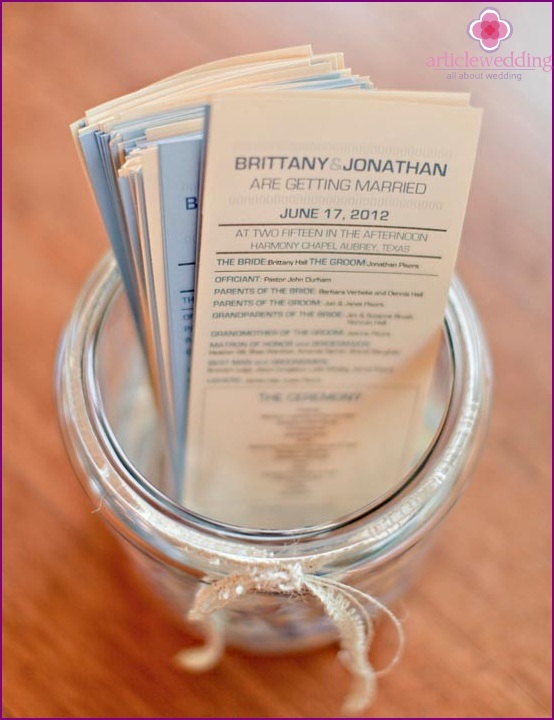 If you want to provide only basic information, without revealing the surprises of the event, the program can be printed as a leaflet or flyer on thick paper. 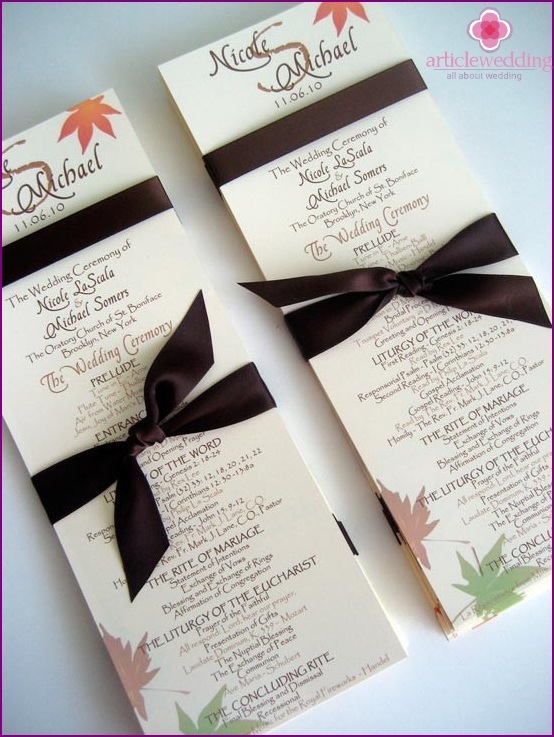 If desired, several different information leaflets tie a ribbon or yarn. 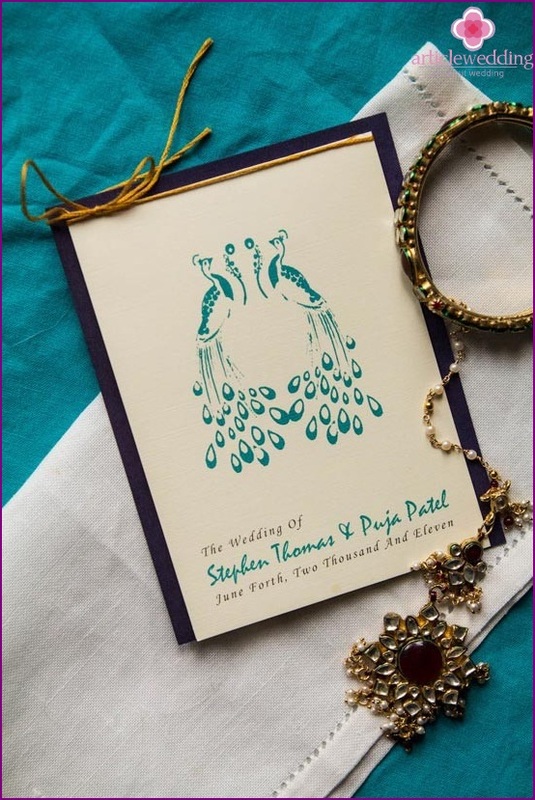 An elegant option - booklets with multiple inserts, decorated in the same style with the use of the tie and intricate patterns. 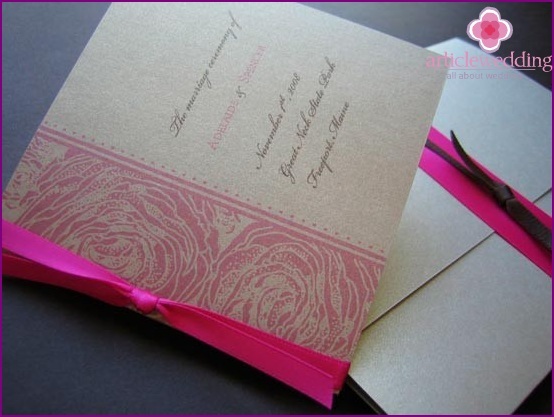 Prepared refined booklet, but something is missing? 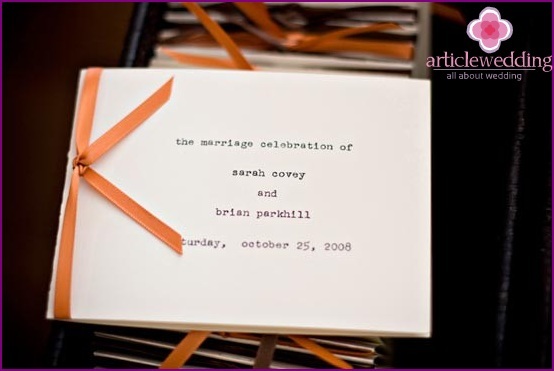 The site offers www.articlewedding.com tie satin ribbon in the middle of the booklet. 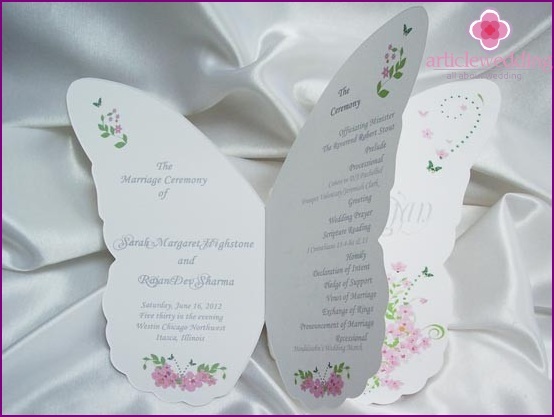 This will give the program a unique charm and elegance. 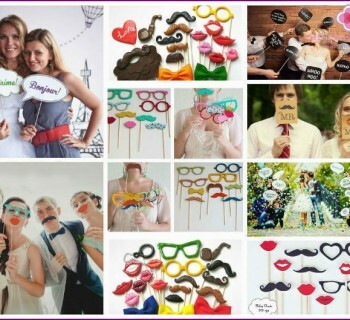 The tape can not act as adressing and separate decorative element of the wedding accessories. 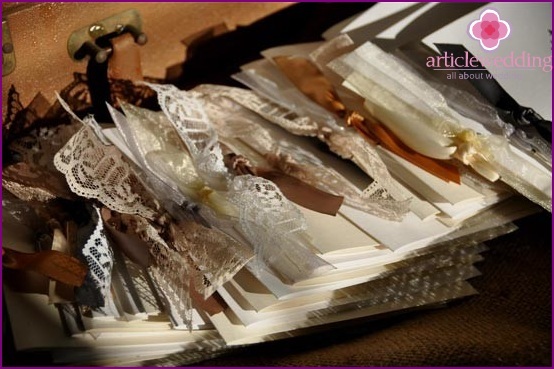 Satin ribbons, lace, embroidery, leather cords easily and securely glued to the paper with PVA glue. 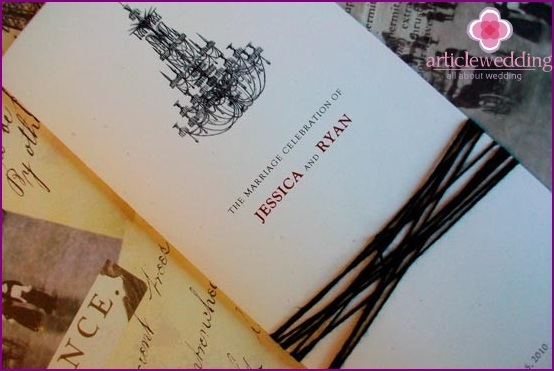 The result is an accessory that matches the color of celebration, romance; In addition, it is pleasant to the touch. 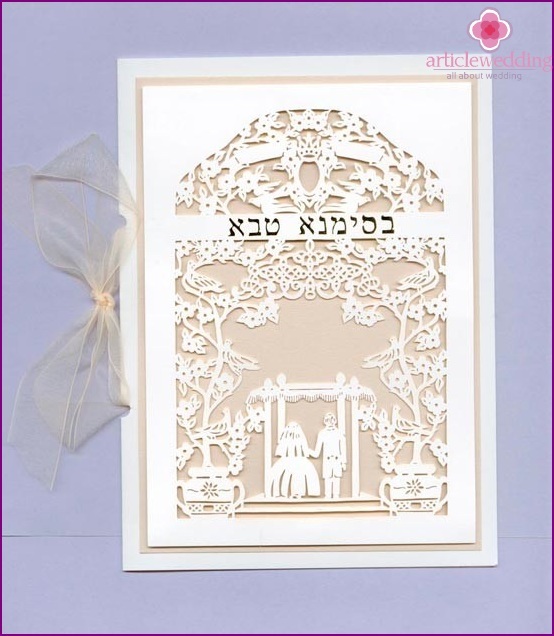 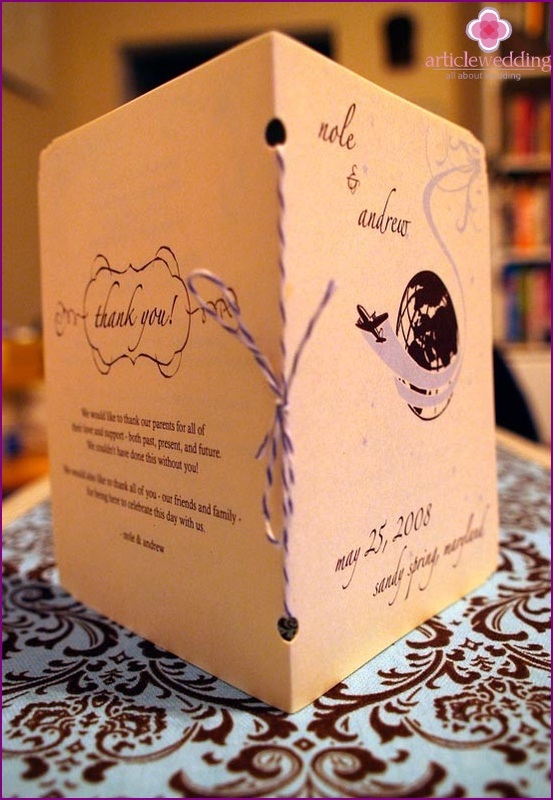 As special greeting arecards, invitations and requests for albums in the art scrap the booking can be made, and the wedding program. 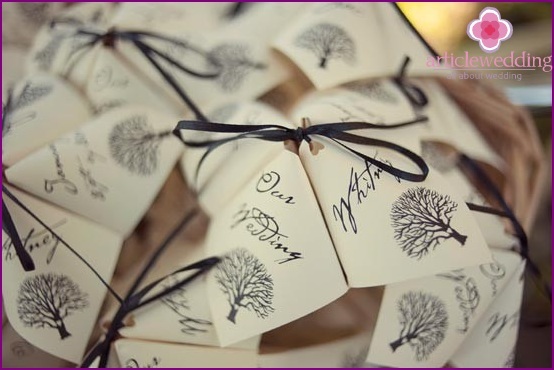 This option will require some skill and material additions, but eventually you will get excellent accessories for the wedding. 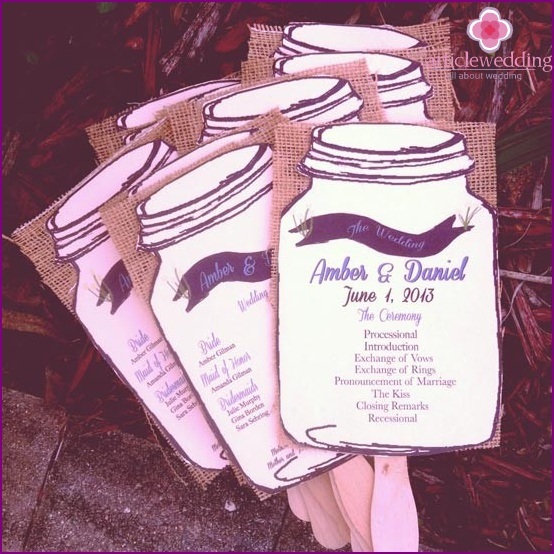 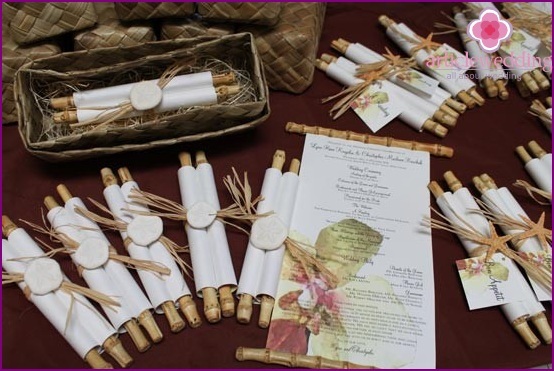 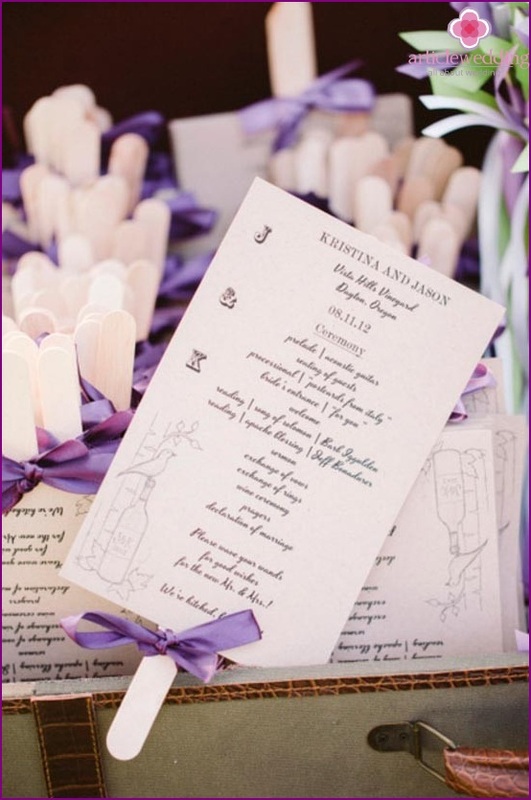 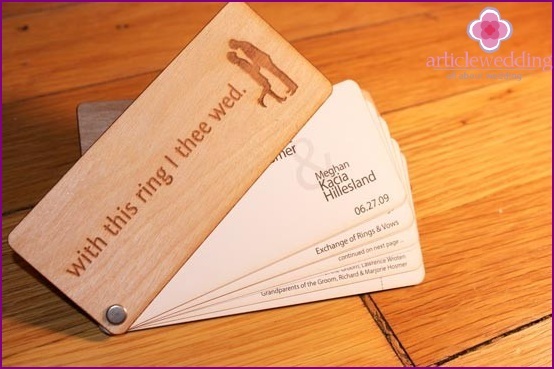 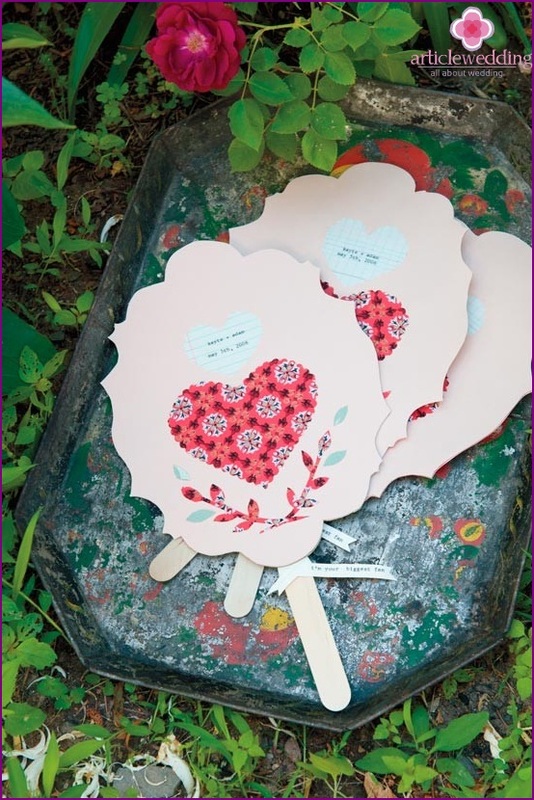 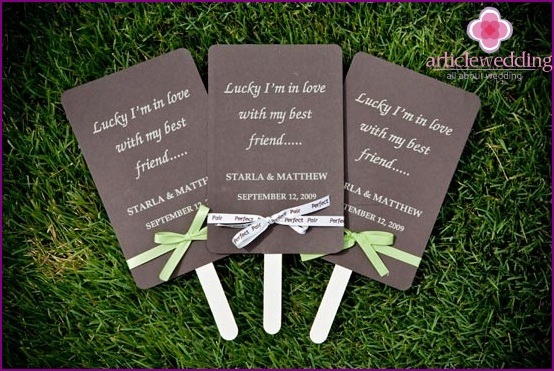 Simple, concise and effective way to createprogram for the wedding with their own hands, which has become extremely popular in recent times - the program on a stick. 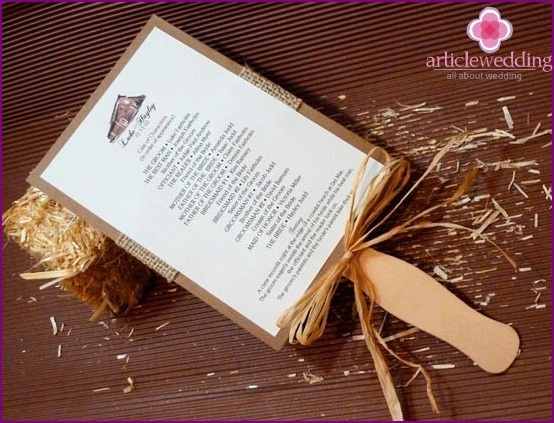 In fact, you must make a standard leaflet on heavy paper and glue stick to it (for example, from a shop for creative or conventional stick for ice cream). 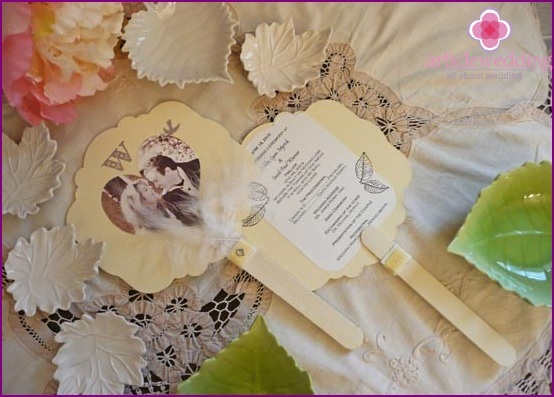 Remember that the accessory is the right and wrong side. 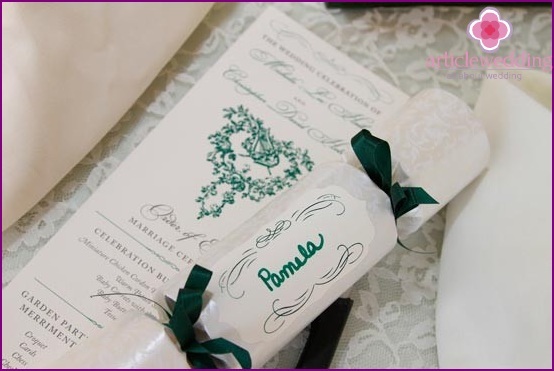 Add several wedding symbols or characters in the subject holiday - and the stylish accessory is ready! 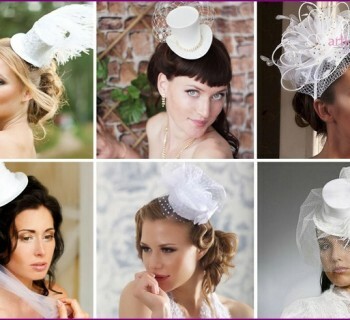 If you want to include a lot of informationprogram but are concerned that the disparate pieces of lost, there is a solution - sew accessory! 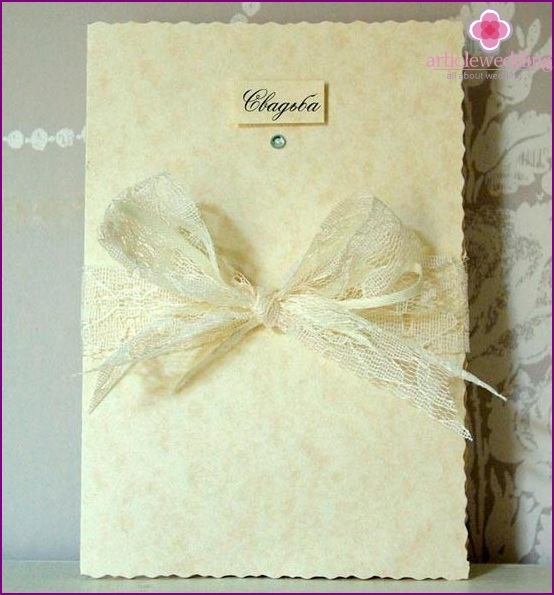 Use plain paper density and ask her a few stitches using bright yarn or thin ribbon. 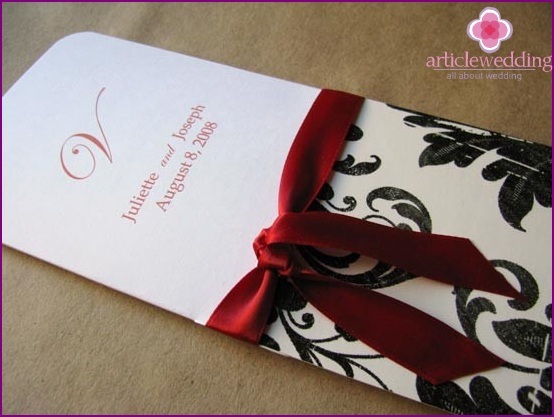 The accessory will look carefully and effectively. 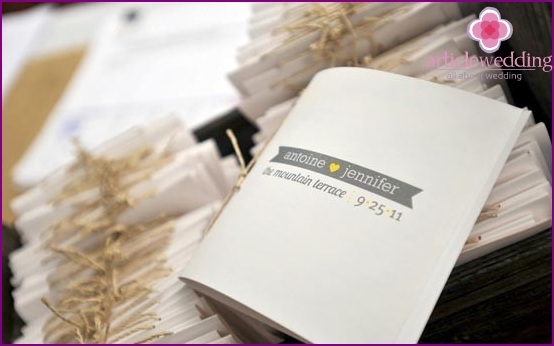 If you like the idea of ​​the program-booklet, butwant more originality - use dedicated buttons for creating notebooks. 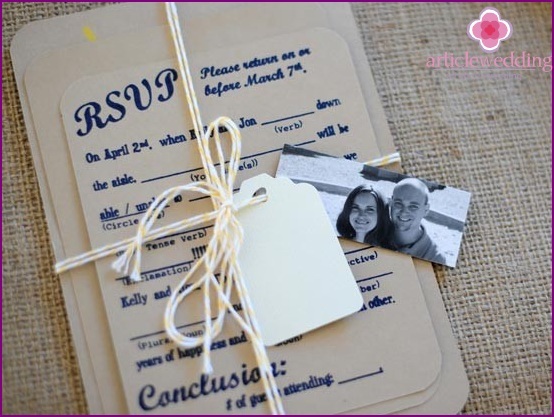 The accessory will be more difficult to implement, but interesting for the guests. 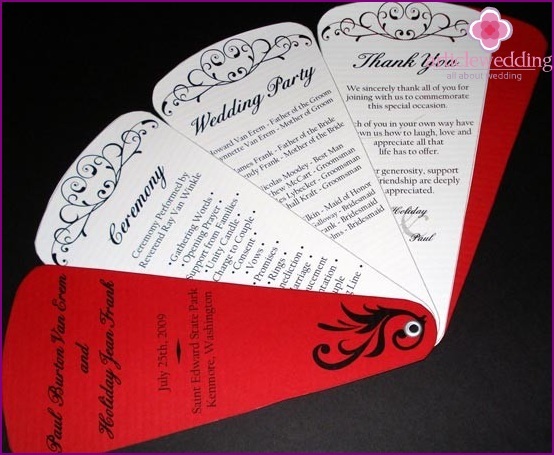 The individual pages will be rotated around the axis and laid out like a fan. 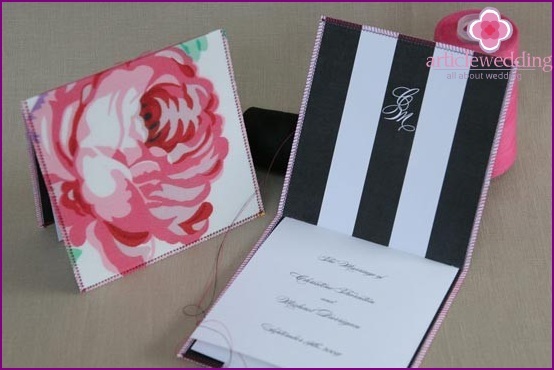 A standard program can be submitted outside the box,if you put it in an envelope. 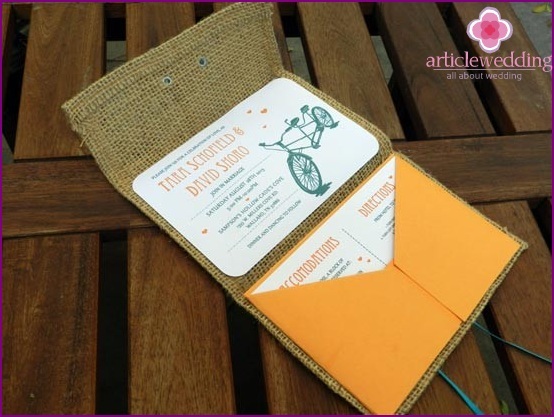 Note that the envelopes are made of different materials: parchment paper, colored paper, hessian, calico, etc. 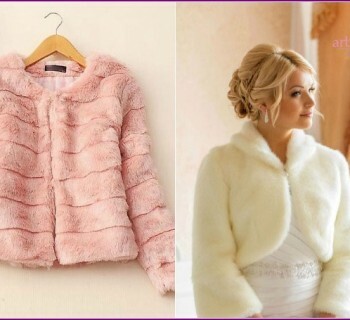 Choose a material that matches the style of the wedding and her design. 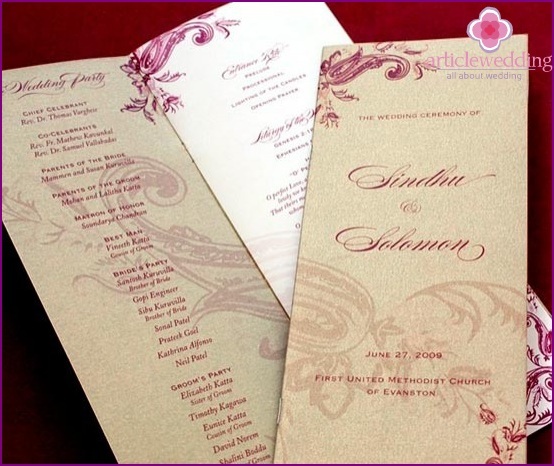 Simple and original option for the magic and history of weddings - a program-roll. 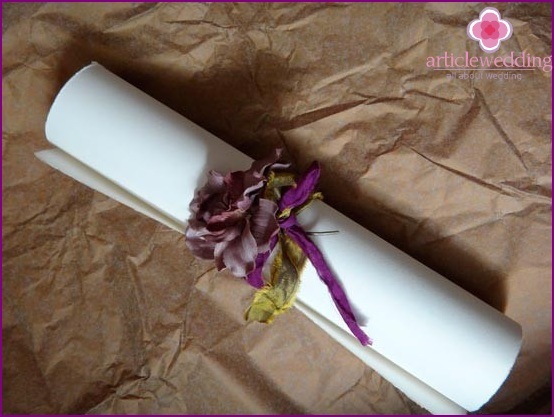 You just need to twist the standard A4 paper and tie it with the tape. 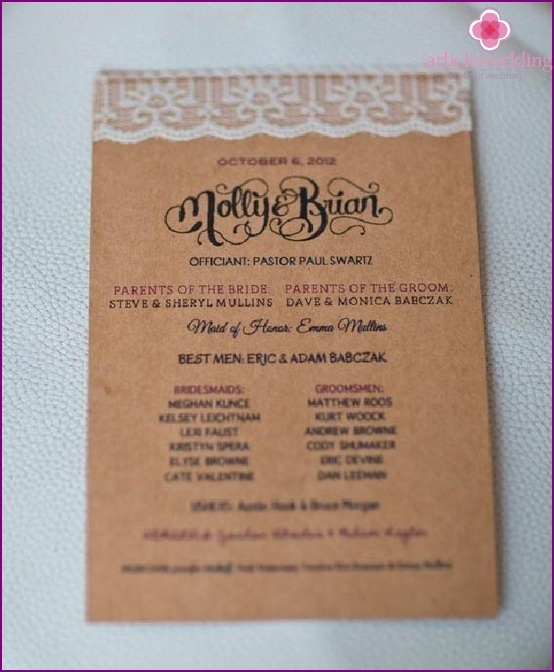 Program-flyer can be submitted original. 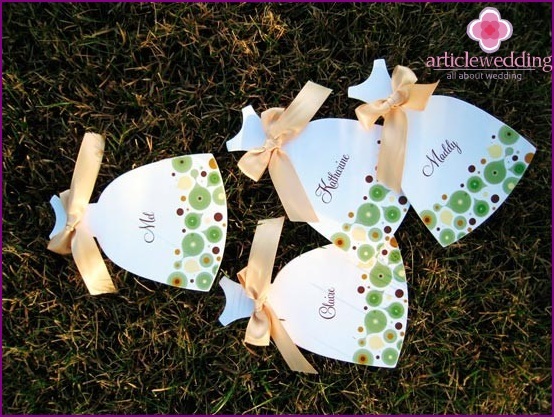 For example, instead of the standard square-shaped cut-out cardboard flower, angel, heart, butterfly or any other symbol to the basics of the program. 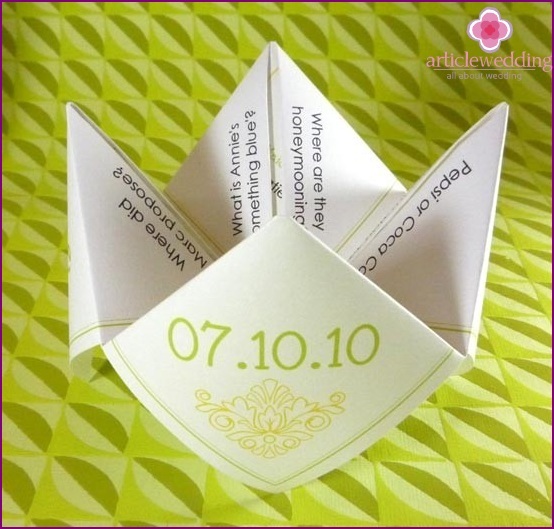 Using origami wedding is becomingmore popular, so why not use this technique for a wedding program. 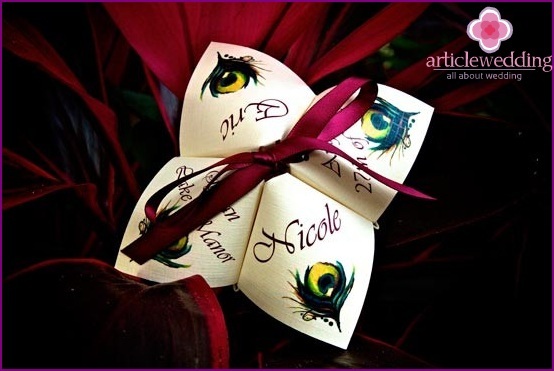 Learn origami diagrams and fold the celebration program in an unusual three-dimensional composition, for example, a box, a flower or star. 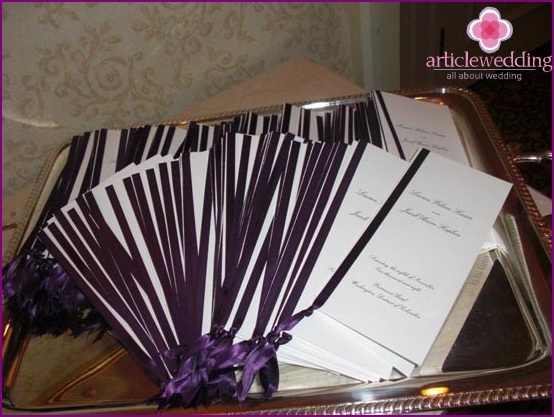 Consider that guests were comfortable handle accessory. 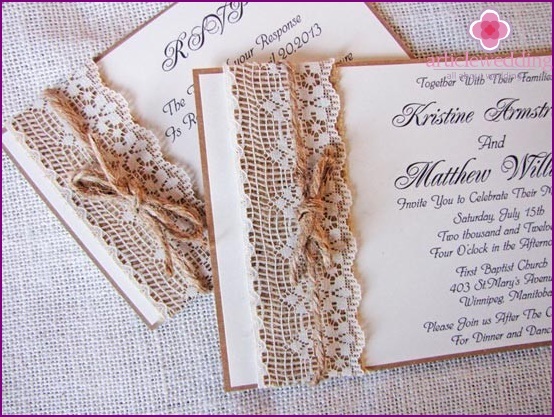 Lace and openwork - the constant attribute of the bride,Sure wedding portal www.articlewedding.com. 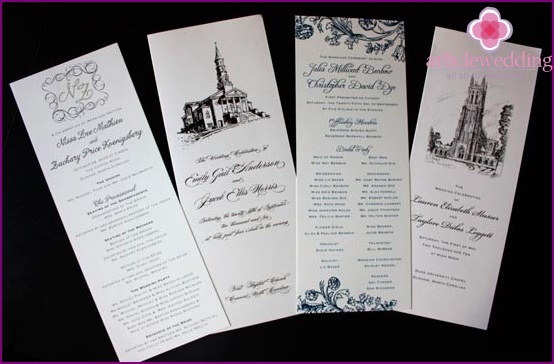 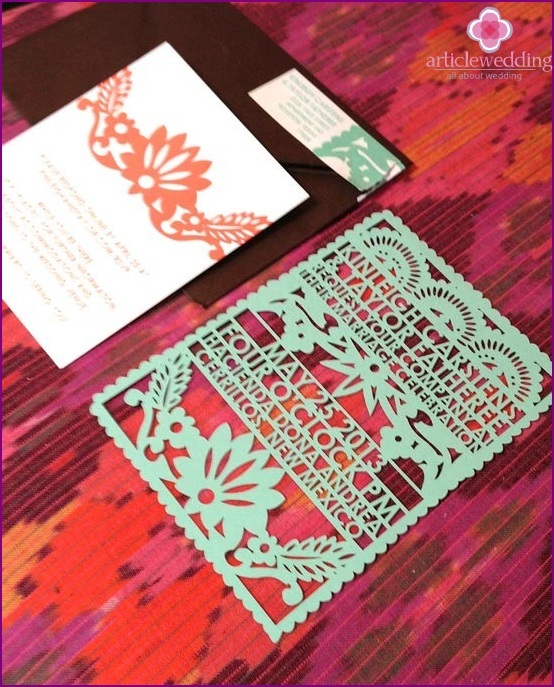 Independently make delicate accessories difficult, but various design blank or wipes to help decorate the wedding program. 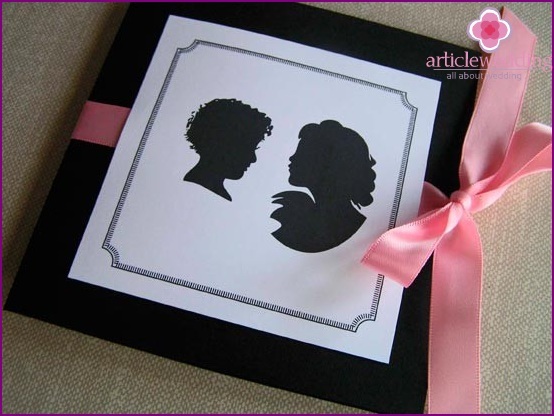 Decorate your photos with software love story ordrawings (or your guests). 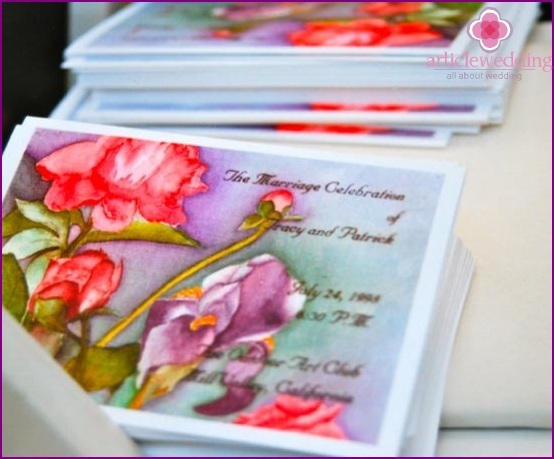 Thus, the program will become more vibrant and individualized. 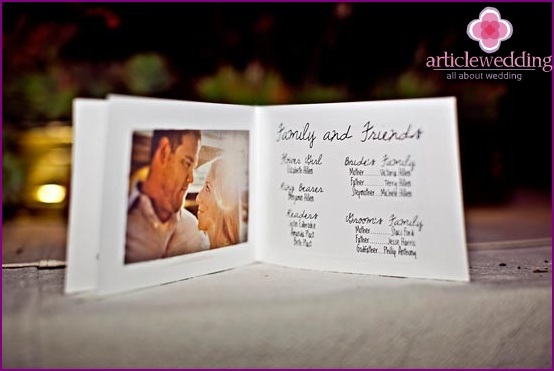 And, moreover, will help guests get to know each other. 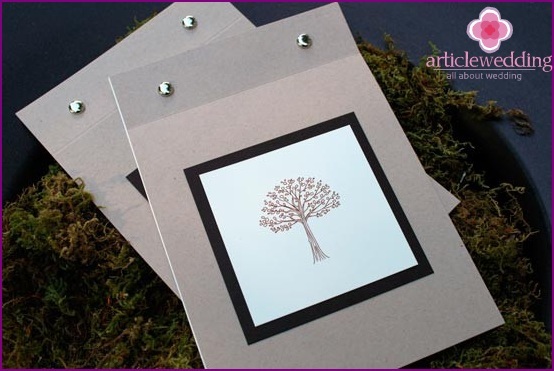 The special charm of paper become accessories to these drawings (watercolor, acrylic or colored ink). 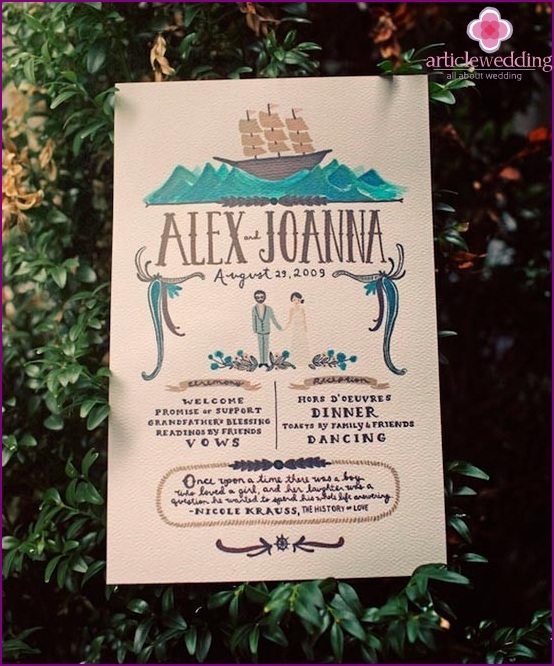 This is perfect for vintage weddings. 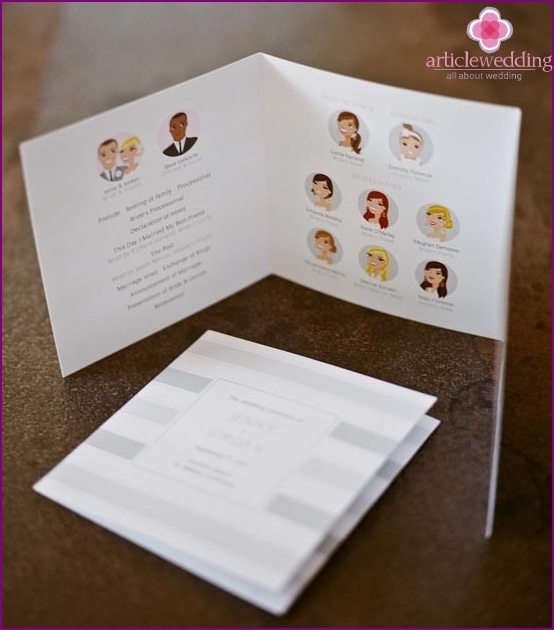 Thoroughly modern wedding program will instantly attract attention and will become an assistant to your guests during the celebration.